Learn 'must-knows' about these crucial cropping tools at this week's Ag Progress Days. With the U.S. Environmental Protection Agency pushing ever-harder on environmental clean-up, access to state-of-science information and technology is extremely important to farmers in the Chesapeake Bay watershed. That's why Penn State's Ag Progress Days is ratcheting up crop management information at the show that kicks off today and runs through Thursday near State College, Pa.
You'll find much needed information in APD's Crops, Soils and Conservation Tent. Cover crops, for instance, are a crucial component in maintaining soil, water and air quality in high-yield agriculture, says Sjoerd Duiker, Extension soil management specialist. CLEAR NO-TILL BENEFIT: Penn State's Sjoerd Duiker shows how conventional soil (left) breaks down, making it more susceptible to water erosion, compared to no-till's stronger soil structure (right). Penn State researchers are, for example, experimenting with grass, legume and broadleaf plant mixtures as cover crops. Several of them will be shown next to the corn maze at the Crops and Soils Tent. Extension educators and board members of the Pennsylvania No-till Alliance will also be on hand to answer questions about no-till farming, establishing and managing cover crops, plus adjusting and outfitting planters and drills. They'll also share how no-till can be made more successful. Buffer strips will be key to the Chesapeake clean-up. 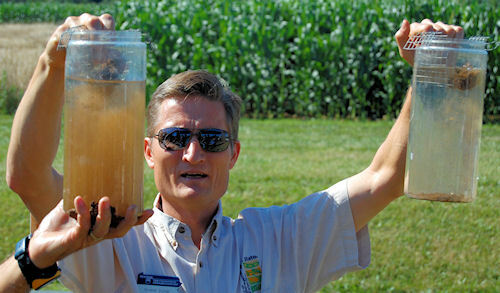 Pennsylvania Soil and Water Conservation Districts will offer a "What is a Riparian Buffer?" presentation, showing how buffers enhance property and improve water quality. The one-hour tour, offered daily at 11:30 a.m., will highlight the benefits of forested and grassed stream buffers as well as how to install and maintain them. "And, we'll show how to establish and maintain native grasses with wildflowers for wildlife habitat, biofuels and more," adds Duiker. "We'll have demonstration plots of native grasses, native wildflowers, grazing forages and plants bearing food for wildlife." Pennsylvania producers continue to move toward greater sustainability, according to Duiker. That's why Penn State experts are teaming up with those of the Pennsylvania Association for Sustainable Agriculture and Pennsylvania Certified Organic group to address questions about what farmers would like to do in their farming operations. Sponsored by Penn State's College of Agricultural Sciences, Ag Progress Days is held at the Russell Larson Ag Research Center at Rock Springs, nine miles southwest of State College on Route 45. Hours are 9 a.m. to 5 p.m. on Tuesday, Aug. 16; 9 a.m. to 8 p.m. on Wednesday, Aug. 17; and 9 a.m. to 4 p.m. on Thursday, Aug. 18. Admission and parking are free. For more information, visit APD's website http://apd.psu.edu. Twitter users can use the hashtag #agprogress.